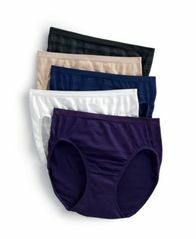 The Seamfree Air hipster's seamless design gives a super-smooth silhouette, and true-to-you shades were made to match your skin tone. Take comfort to new heights with Warner's Cloud 9® Wire-free bra. The super soft fabric provides luxurious comfort that will make you feel like you're floating on a cloud. It's so soft you may never want to take it off! Achieve a smooth, perfect look under your favorite outfit with the seamless style of this comfy bikini from Jockey. This smooth style belongs in your intimates collection. The Seamless Hipster by Jenni by Jennifer Moore.